That’s how I’d describe my mum’s ginger tea, or as it’s called in Indonesian, wedang jahe. 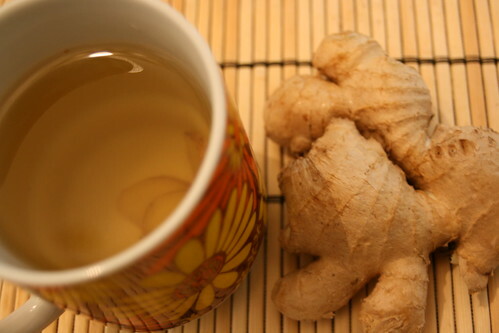 Ginger tea is wonderful on a cold wintry day. I love how the viscous liquid slides down my throat and warms my chest–it’s my drink of choice as I curl up in front of a toasty fire for a riveting read (no offense to all you hot chocolate fans out there). 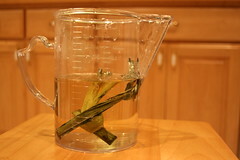 My mum insists that the secret to great ginger tea is daun pandan (pandan or screwpine leaf) syrup. “Supaya harum,” she says, or to make it smell good. All it is is a simple syrup steeped with pandan leaves. You can find pandan leaves frozen (and to my utter delight, sometimes fresh!) at any Asian grocery store. This heady, fragrant leaf (I’ve heard people describe it’s flavor and fragrance as coconut-ty and it’s even compared to buttered popcorn!). Sometimes called the Asian vanilla, the pandan leaf, in my opinion, has no substitute. Like all simple syrups, the ratio of sugar to water is 2:1 so you can adjust amounts according to your needs. Use 1 pandan leaf for every cup of sugar. The cooled syrup can be bottled and keeps in the refrigerator indefinitely. You can use the syrup to sweeten regular tea too. In a medium 2-quart saucepan, combine all ingredients and bring a boil. Lower heat and stir continuously until sugar dissolves, about 8 to 10 minutes. Remove leaves and reserve syrup. 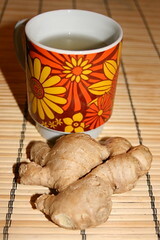 Smash ginger with flat part of a cleaver or large knife’s blade until the skin splits and the inner flesh is exposed. In a large 6 quart pot, combine all ingredients and bring to a boil. Lower heat and simmer for about 20 minutes. The longer you simmer, the stronger the ginger tea. My co-worker gave me some ginger tea from the Philippines. Oh my goodness what a delicious tea. I had laryngitis and bronchitis and it was extremely soothing to my throat! If you get a chance, try making this recipe from scratch. It’s so easy and is very comforting on a chilly day. Enjoy! That’s teh halia or teh tarik in Singapore! That’s yummy especially since the tea is “pulled” i.e. poured from one container to another to introduce air and bubbles before being served in glass nice and frothy. Marvin, ginger tea is soooo good! Niki, I won’t be surprised if pandan cocktails start popping up in bars across the nation! This was amazing, I’m going and getting some leaves and ginger this weekend for sure. Since simple syrup is a common cocktail ingredient, I also wonder if the pandan syrup could give a nice herbal touch to the right mixed drink as well! Your ginger tea looks so comforting. I must find some pandan leaves! I’ll have to try your version, Diane. Anything with cardamom tastes great in my book! Thanks for sharing. I make a version of this often in winter…min is an Indian version: fresh ginger boiled in water for at least 10 minutes with cardamom and jaggery (an unprocessed sugar similar to but better than brown sugar). Mmmmmmmmm…..
. . .BEST . . . tea . . .ever. Best.